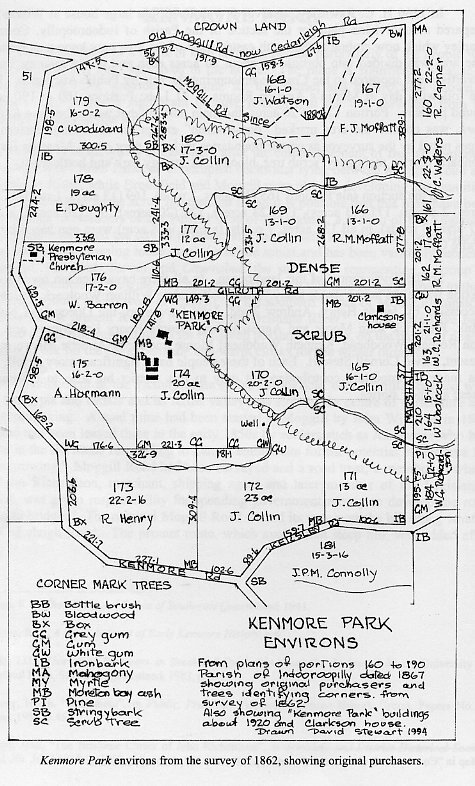 In the 1840's the area now known as Kenmore was part of a sheep and cattle run which extended from Milton to Mt Crosby, and owned by a man named McDougall. The area was surveyed in the 1850's and after the establishment of the colony of Queensland in 1859, was released for sale in 15 - 20 acre lots to the wave of new settlers arriving from Britain. The earliest land holders were John McGrath and J. Twine, who were both living on their selected land as early as 1849. Other early families where the Paceys, who rented the land where the Queensland University vet farm is now; and Andrew Todd, who purchased 100 acres of land on either side of what is now Gilruth Road. During the 1850's and 1860's the pine, cedar, softwood and hardwood around the Kenmore and Brookfield area was the source of much of Brisbane's timber. It was drawn by bullock wagons along what is now Rafting Ground Road, floated down Moggill Creek to the river, and rafted to the sawmills near the present day William Jolly Bridge. Later a sawmill was in operation on the corner of Gap Creek Road and Brookfield Road. There were also small farms in the area, producing a variety of crops. Potatoes, Maize, arrowroot, sugar, grapes and other fruits and vegetables were grown. Cotton was also grown and supplied to the Lancashire cotton mills during the time of the American Civil War, when US cotton production was disrupted. In the 1860's there were few roads, so one of the most convenient forms of transport and communication was the river. There was a small fleet of steamers carrying goods and passengers between Brisbane and Ipswich.Also the farmers along the river used small flat-bottomed boats which were rowed with oars to take their produce to markets in Brisbane and Ipswich. About 1880,Andrew Todd bought 100 acres of land in the centre of present day Kenmore. He built a large home and named the property 'Kenmore Park', after his home town of Kenmore in Perthshire, Scotland. Subsequently the name Kenmore was applied to the present district of that name. Andrew Todd gave the Presbyterians half an acre of his property to build a church. It opened in October 1885. The Kenmore congregation, led by the Reverend William Patterson, had held services in a small hall on the banks of Moggill Creek, built by the Orange Lodge in 1871. The first church was used until the size of the congregation grew too large, and the present Uniting church was built in 1967. The earliest school in the district was a private school operated by Mr Storey in the 1870's in the Orange Lodge Hall on Moggill Creek. In the 1880's, the Lodge, like the church, moved to a more central site and built a larger hall in Moggill Road, where the first Post Office stood. This was used for another private school until a State Primary School was established in 1900. The first school building was erected on the present site in 1904. An early school mistress was Miss Bessie Palmer, sister of author and playwright, Vance Palmer. In the time when all transport was horse drawn there needed to be blacksmith's forges. At about 1900 there were two in Kenmore, one on the corner of Brookfield Road and Moggill Road and another opposite, where the fire station now stands. The earliest store in the area was also on the corner of Moggill and Brookfield Roads. It was opened in 1919 by Mildown and Cox, and was called "Hyde Park". Dairying began to play a large part in the local economy in the early 1900's. One was run by the Pacey family where the Uni. Vet farm is now. They used to get 9 pence a gallon on their "warm milk run", and sent surplus supplies by rail from Indooroopilly to the Booval butter factory. Up until 1930, when the Brisbane Abattoirs were established, there were five slaughter yards in the Kenmore area. These included Lisk's in Huntingdale Street (then Pullenvale Road); Irish's, who had 60 acres at Wongabel; Land's at Chapel Hill and Dobson's at Fig Tree Pocket (now Cliveden). Joe Lisk was killed in an accident and his widow married Penhalligan. This is how Penhalligan's became butchers. There are few remains of the local aboriginal population. At one time there was a bora ring on the southern slopes of Mt Elphinstone and another between Kersley Road and the Brisbane River. In 1947 John Morgan bought and named Wongabel Estate, from Jack Irish and kept racehorses on it. The old Kenmore Presbyterian Church was at this time (1967) the centre of some controversy due to its location in Kenmore Road. In 1968 the old church was moved behind the new Uniting Church in Moggill Road, where it is now known as the Pioneer Church. The church was established in 1885. The book "Kenmore Park - The land, the house and the people" by Jan Stewart shows the location on Kenmore Road outbound of the intersection with Moggill Road. Ref: Brisbane's Western Suburbs - Our Heritage in Focus. Also "OurBrisbane - history of Kenmore"
Kenmore is a suburb of Brisbane in the Australian state of Queensland.